Hi there! It's me. THAT girl, who is finally posting more Convention pics...a week and a half after Convention ended. *sigh* My schedule hasn't allowed me much free time recently, but I figured better late then never, right? I did share another Convention post HERE, if you would like to check it out. On that note, I FINALLY cleaned up my stamp room today and that meant putting away all of my loot from Convention. 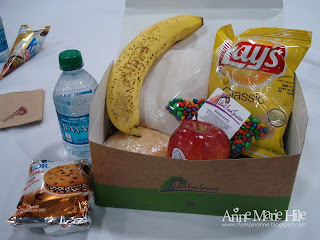 Before I did, I wanted to snap a few photos to share all of the awesome treats we received in Salt Lake City, especially that fabby chevron bag! Eeek! Here is the big picture of ALL of the goodies I returned home with. (....not including the items from the famous Momento Mall) Oh my WORD! 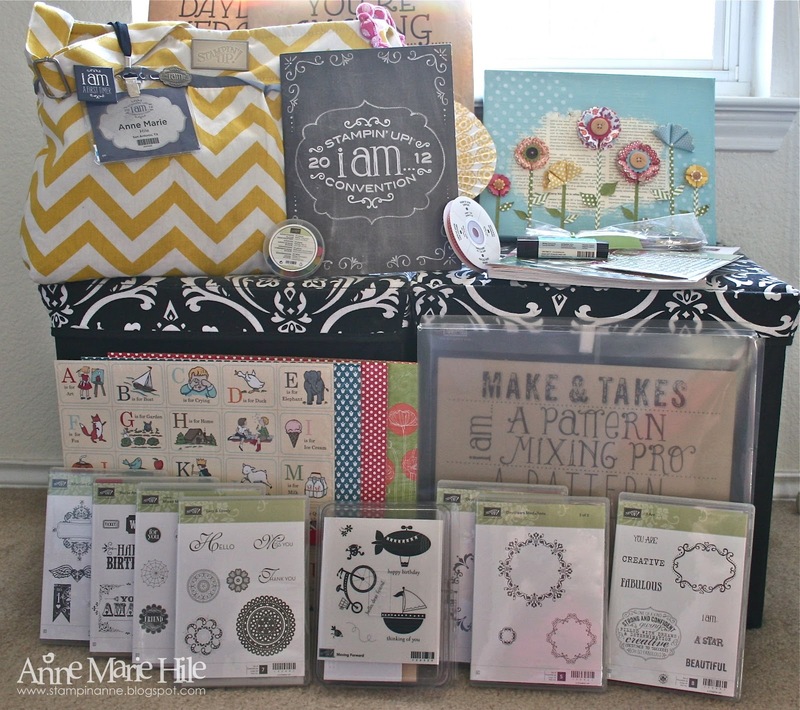 Look at all of the stamps and paper! That's a lot of rubbah to get crafty with, folks! Not to mention, all of the inspiration we received from the thousands of sample projects on the boards and presentations at Convention. You have to see those boards to believe them! Every time I walked through, I found something new that inspired my creativity. Here is a close-up of my canvas wall art project from the fantastic "I'm a Pattern Mixing Pro" class presented by the always fun, Carrie Cudney. A close-up on the dimension of the flowers and leaves. I actually put this all together after I got home (...yesterday, actually) because I didn't want to smash these little pretties in my suitcase. Don't you love this project? 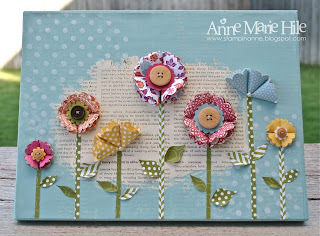 Well, if you are here in the San Antonio area, I will be having a class to learn how to make one of your very own. Stay tuned for details....I have a surgery on both of my feet to get through this Friday (can you say stressed out?) before I can set up my class calendar. I have 8-12 weeks of at-home recovery to look forward to. 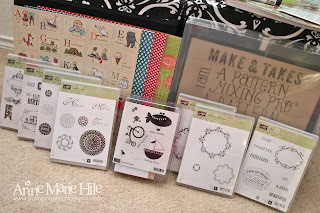 Hopefully the recovery will go as planned and my sweet hubby can wheel me into my craft room. I am optimistic about a class at my house in the next month. If not, then maybe HE can host a class...and who wouldn't want to come to that? Yes, I took a photo of one of our lunches. I realized on Saturday that I needed to take more pictures of this wonderful experience at Convention, so anything was fair game at this point! Lol! Saturday night we went to dinner at a yummy Brazilian restaurant in downtown SLC, Tucano's. Here is one of my favorite photo's from the evening, with two amazing women who always inspire me, in so many ways: Mary Fish and Ann Schach. I really needed to turn my flash on for this one, the lighting was not so great...but these ladies absolutely ROCK!! I can't say enough about my trip to Convention this year! I have TONS more photos but I'm sure you don't want to see them all. Such a great experience and such wonderful memories with all of my stampin' friends, old and new. 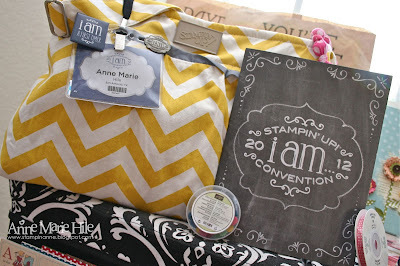 Thank you Stampin' Up for hosting such a fun and inspirational event. I will see you again in 2013! Thanks for sharing more of my my Convention memories with me! Looks like an amazing time AM! I will be thinking of you on Friday...all will be ok!!! Aw! Thanks for the sweetness, Anne Marie! Convention was fabulous...and it was because I had the best roomies in the world! I can't wait until next year! Same hotel??? Looks like you had a wonderful time. And all the new goodies !! 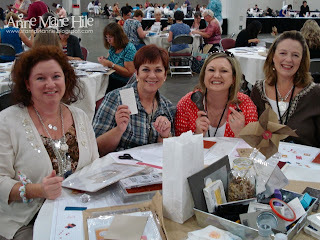 I'm enjoying your convention photos regardless of when you post them, Anne Marie! Looks like you had so much fun, and your loot just makes me drool! Ann Marie what a haul you made! Wow... LOVE your project, how cute is that! I'm sure all had a blast and can't wait to go again..one of these days I'd love to meet everyone in person. 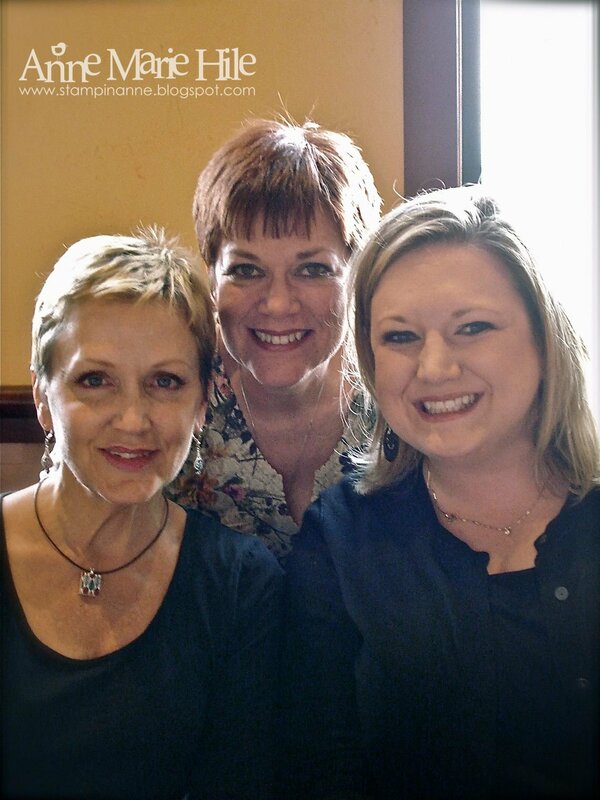 The photo of you, Ann and Mary is Fabulous! What a great shot of 3 of my FAVS. I'm hoping your foot surgery goes well and I'm sure your hubby will help with your class if needed... wish I could come too! Happy Healing. Loving this beautiful creation. So well designed, everything works together perfectly. Love those folding techniques. Thanks for sharing these....almost as good as being there! 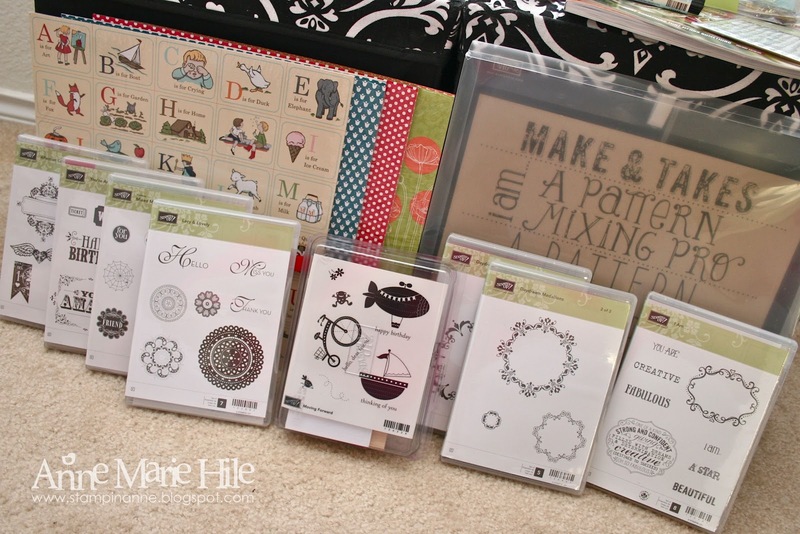 I love that you scored all those goodies and your little patterned floral card is adorable! Aww - what great loot, AM! I'm kicking myself for not going this year now as I would have loved to have met you and Ann! Sending you lots of good thoughts for tomorrow! I missed convention this year, but I do hope to attend again! Sounds like a marvelous time! LOVE all of the goodies and that lovely canvas! Hugs and prayers for your surgery! LOL at hubby teaching the class! I can just imagine my DH trying to pull that off! WOW! Looks like SO MUCH FUN!!!!!!!! And holy goodies that you took home with you!!!! I LOVE the project! Those flowers are just awesome!!!!!!! Thanks for sharing your convention memories with US, Anne Marie! You can sure tell you had a marvelous time. I hope everything went well today. Sending best wishes for a speedy and full recovery! A Big Woo Hoo! Look at all that loot in your Studio! First Conventions are Awesome! I can't believe I got to meet the Star Pals and be photoed with you all! You girls are the best! Absolutely love the canvas wall art! 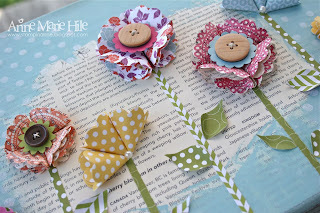 Do you offer a tutorial on making those flowers? Thanks!